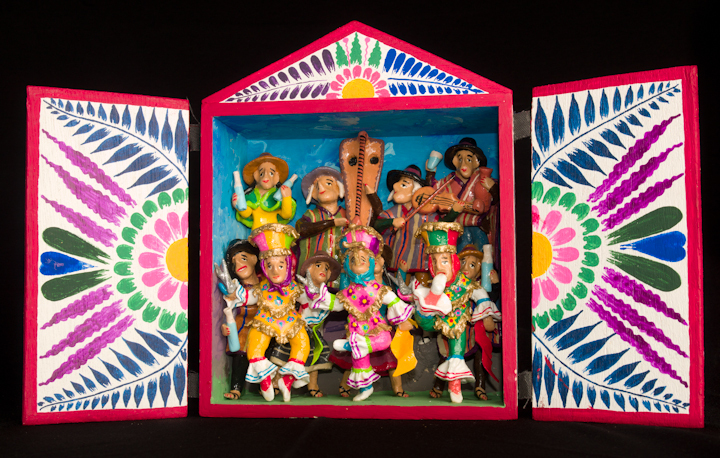 Jeronimo E. Lozano grew up in Huamanga, a village in the remote, mountainous Ayacucho region of Peru, an area that he has characterized as “rich in ancient Inca culture and traditional beliefs.” His artistic talent was obvious at an early age. 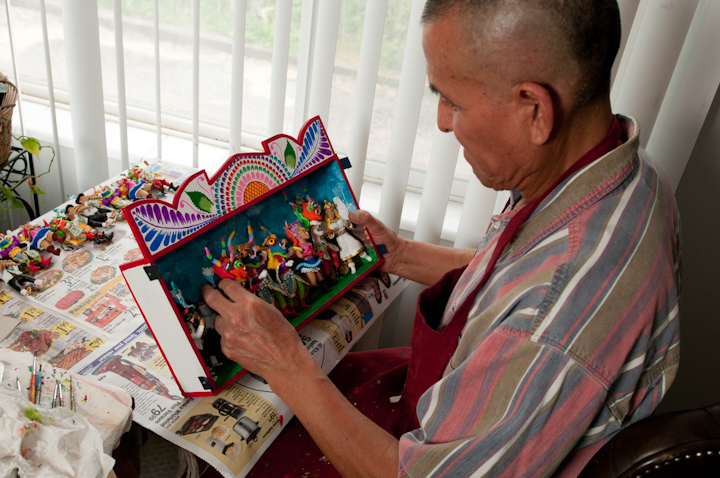 When he was about 8 years old, someone asked him to repair an old retablo – a portable altar in which figurines often depict Catholic saints. He experimented until he figured out how to make the repairs and was paid with a baby lamb. 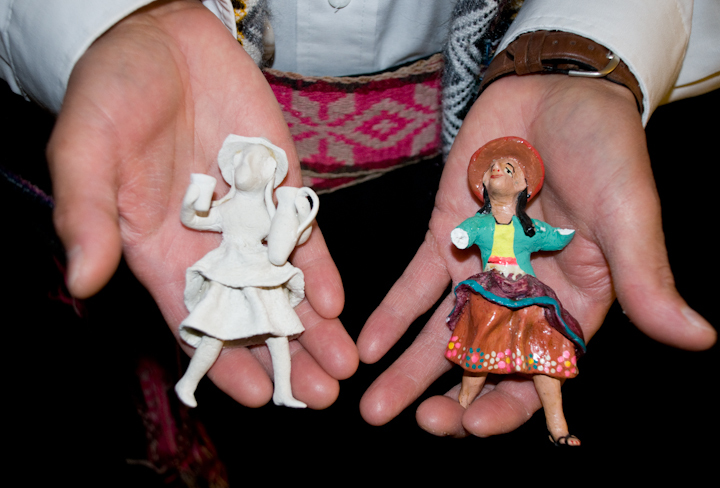 Determined to earn a living as a retablo maker but lacking a mentor, Lozano found that he could make plaster from rock formations in the mountains. 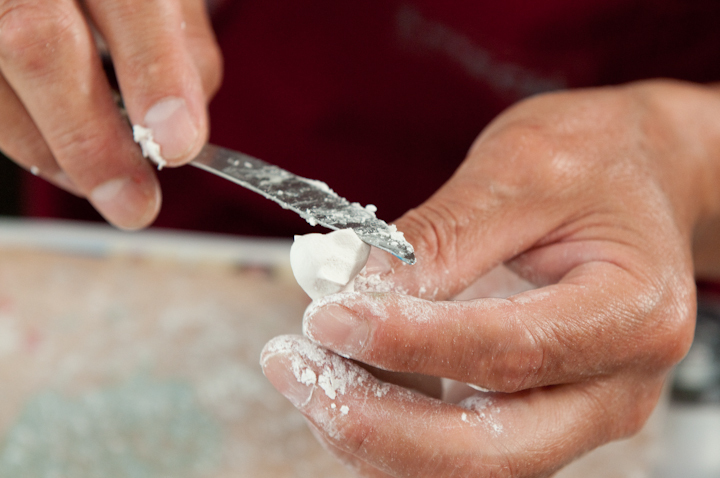 He mixed the plaster with a paste made from dry corn flour cooked by his mother. He learned to extract colors from plants. He mixed pigments with the juice from a prickly pear cactus and said he later learned that the Incas had decorated their palaces with such paint. 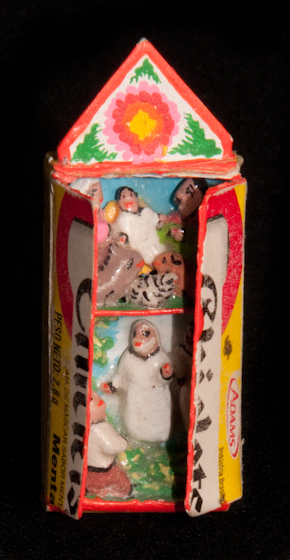 By age 16, Lozano had retablos for sale in tourist shops. 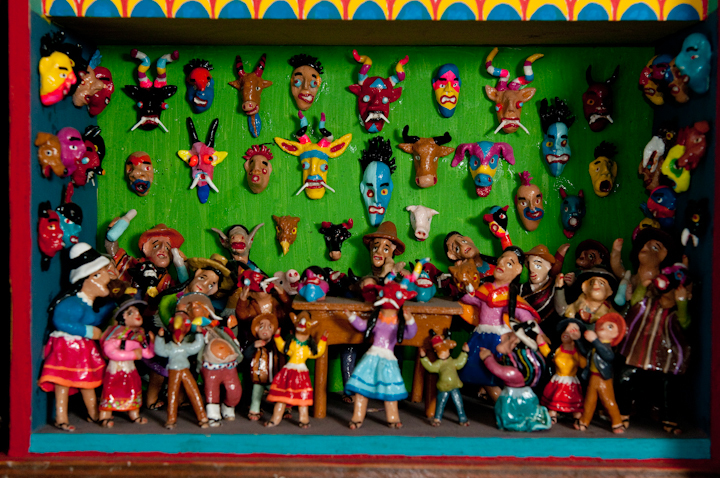 A Peruvian arts historian saw his work and arranged an exhibit at a gallery in the capital city, Lima. 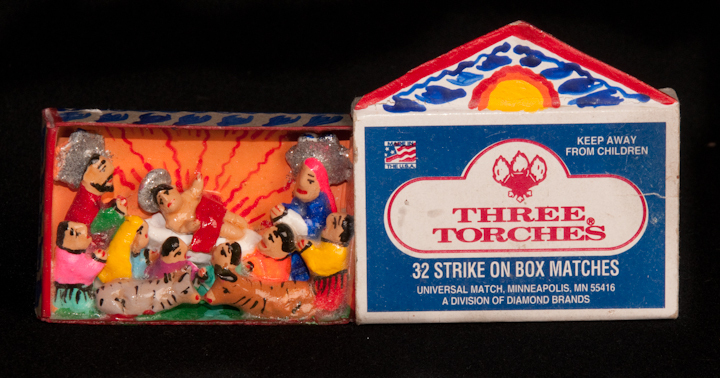 While he was there, he received a call from his father, telling him not to return home because the Communist Shining Path guerrillas were targeting anything they perceived as displaying Western influence. 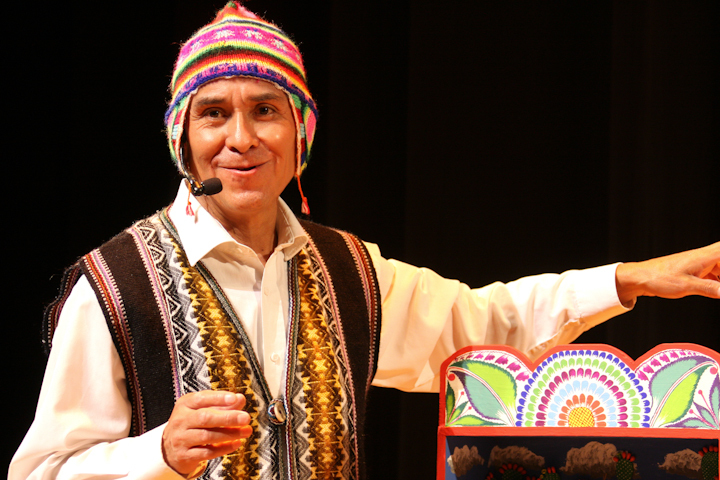 Lozano remained in Lima for about ten years and studied at the School of Fine Arts at the University of Peru. 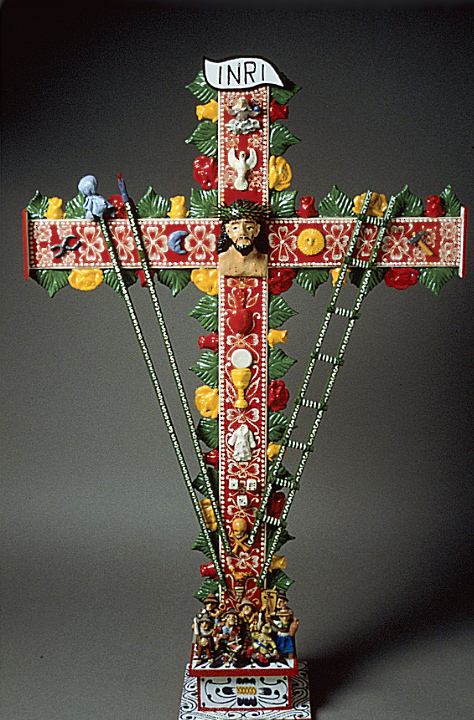 His work there included traveling throughout the country to study folk art traditions. 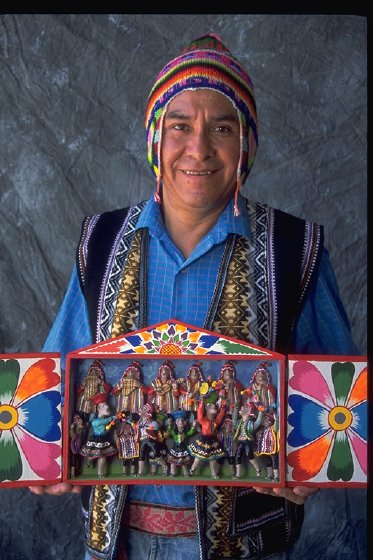 In 1994, the Peruvian government asked Lozano to accompany an international folk arts group on a tour of the United States. On a visit to a festival in Bountiful, Utah, he was invited to remain and to display his work in galleries in nearby Salt Lake City. He stayed on an extended visa and then became a legal resident. 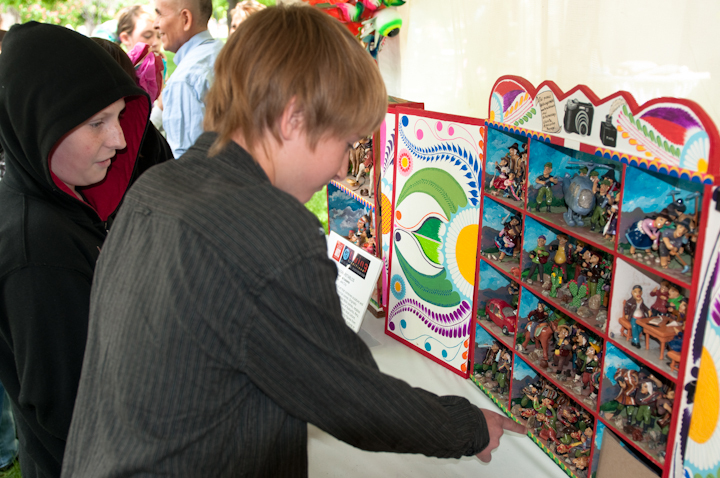 Retablos originally depicted Catholic saints. 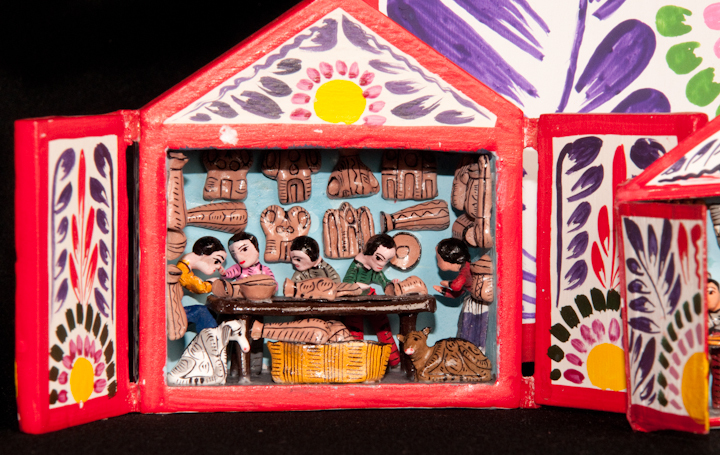 In the Peruvian highlands, they came to also portray scenes from daily life. 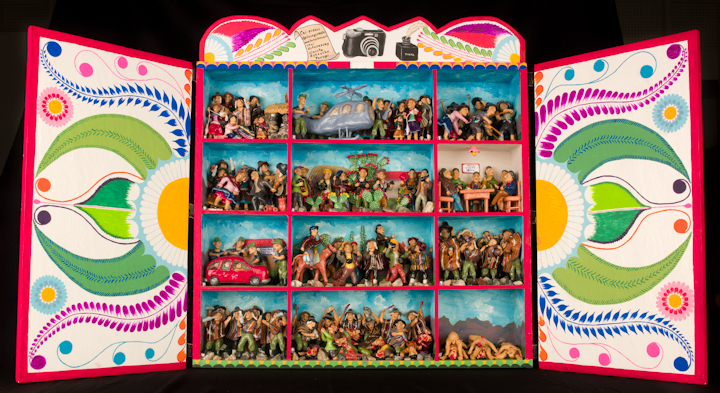 With the encouragement of retablo master Joaquin Lopez Antay, Lozano expanded the subject matter to include theatrical dramas, scenes from American and Peruvian history and political statements about current events. 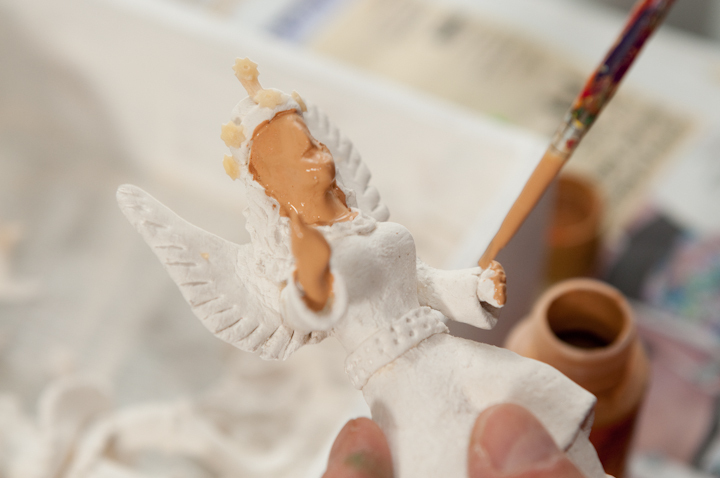 He uses his own method of hand-sculpting and painting each figure, unlike many retablo artists, who use standard figurine molds. 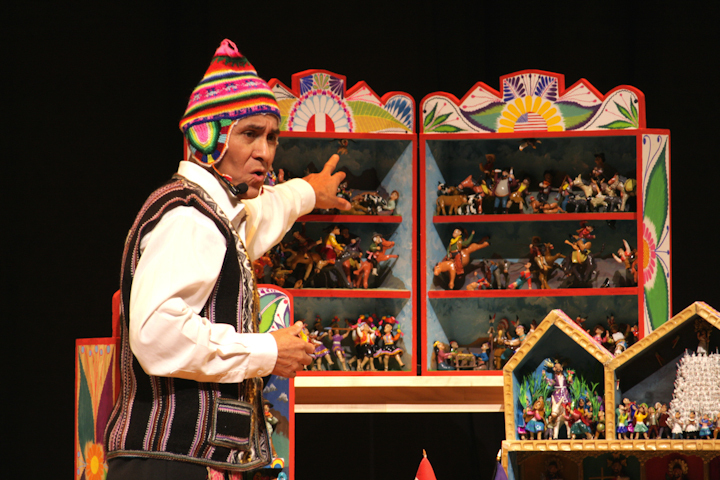 He has also built retablos in which the traditional wooden box is replaced by a hollow gourd or bamboo enclosure. 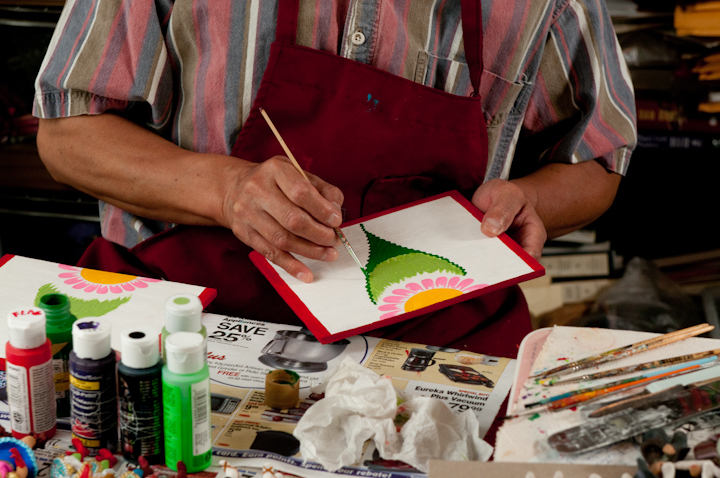 In the United States, he has learned to use bright commercial colors and varnishes. 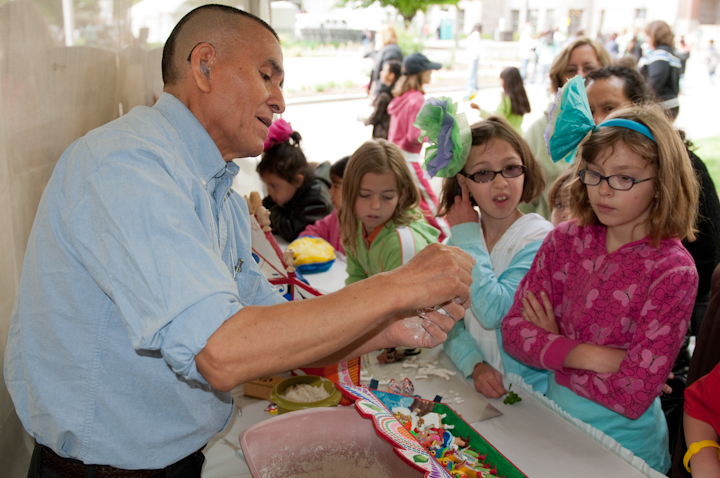 Through the Utah Arts Council, Lozano has taught his art in schools and to disabled people in rest homes and other facilities. 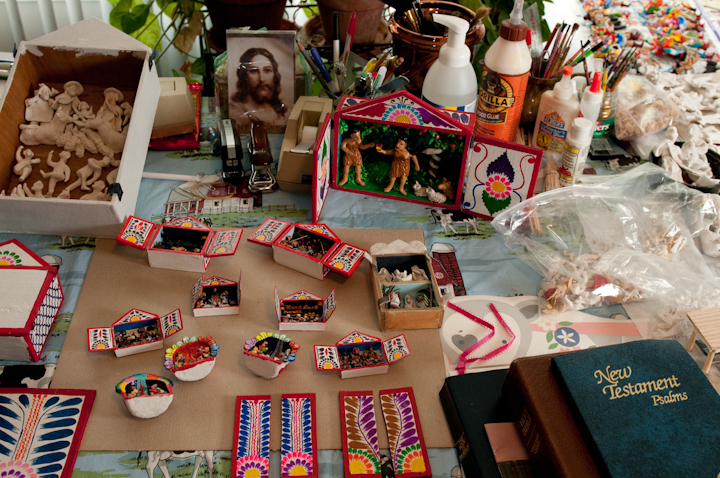 He enjoys teaching and encourages students to draw on their own experiences and customs to create retablos. 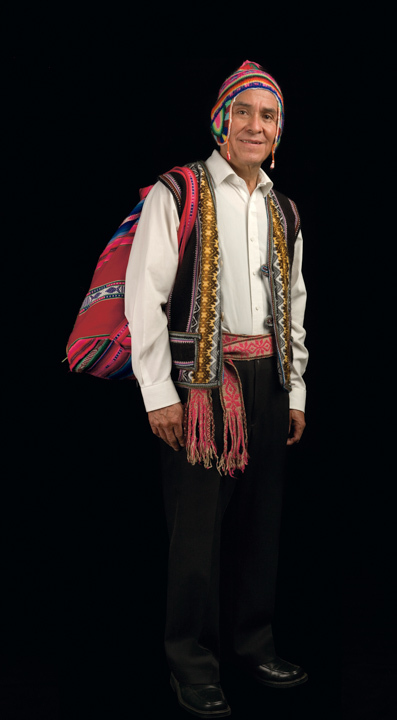 “Jeronimo Lozano a National Heritage Fellow.” The 15 Bytes Blog: Utah’s Arts Magazine (September 22, 2008). Wadley, Carma. 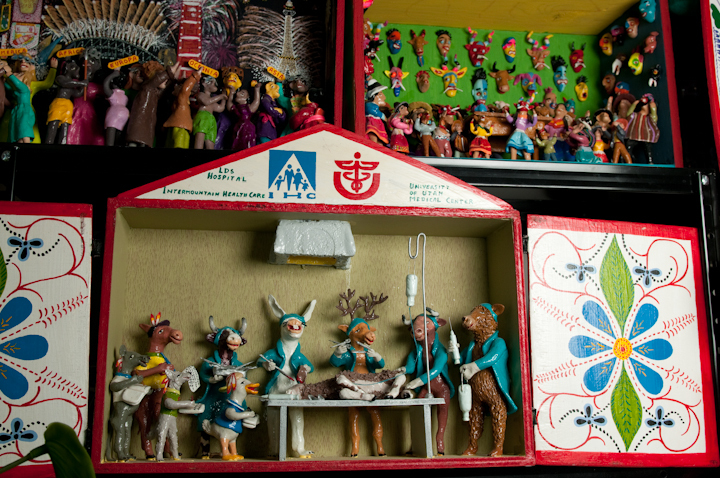 “Stories without words: Folk art depicts Peruvian culture.” Deseret News (December 9, 2007).